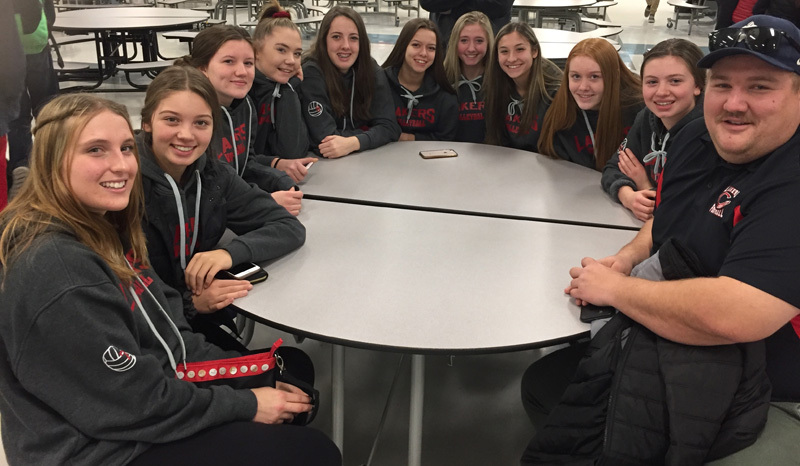 The fall sports season is now over, after the Senior Girls Volleyball team participated in 4A Provincials, this past weekend. The basketball teams start tournaments this weekend with Rocky View league action the week after. The Chestermere High School Senior Girls Volleyball team competed in the 4A Provincial Championships, which were held in Grande Prairie, this past weekend. The team came up against some very tough competition playing teams from Catholic Central, Centennial, Bishop Caroll and Jasper Place High School. The Lakers played hard, had fun and gained valuable experience for next year. They now have a better idea on what they are up against and what the 4A competition looks like. Coach Taylor is very proud of the team’s performance this season. With a young team consisting of 3 grade 10s and 6 grade 11s, and only one Grade 12, expectations were not only met, but were exceeded. Look forward to a very strong team next year. Thanks to Coach Taylor for all of her time, expertise and hard work this season. The football team will have their annual windup awards night on Tuesday, December 4th. Each player will receive their team picture and team awards will be given out. As well, Rocky View League All-Stars will be announced. Results and pictures will be in the article next week. The Senior Boys and Girls basketball teams will open their season, this weekend, with the District 4 Tournament, in Calgary. This will be a very competitive tournament for each of the teams. With both senior teams being very young, this will be invaluable experience, and will pay dividends later in the year. Best of luck to the teams.